Learning Resources LER6968 - A handy flip-out stand is great for tabletop use. Helps children learn to manage playtime, independent reading, transitions, homework, and even time outs. Features 3-color lighted display and simple to program alarms. Alarms can be visual, audio or both. Alarms can be great for children who are visual, auditory, or both. Features a 3-color light display and simple-to-program alarms. Time tracker adheres to any magnetic surface. Help children learn to manage playtime, homework, and independent reading with this visual timer that sticks to any magnetic surface. Learning Resources LER6900 - Timer for kids features 180° viewing and a large, easy to read LCD display. Keep kids on task with our improved timer that uses both light and sound cues. Requires 4 AAA batteries, not included. Keep the whole class on track with light and sound cues. Requires ac adapter ler 6989 or 4 AAA batteries, neither are included. Timer measures 8" x 4". Simply program the green, yellow, and red light-up sections and audible cues to indicate the time remaining. Features 180° viewing and an easy to read display. Timer allows quick programming of 3 colored lights that alert kids to remaining time. LER6909 - Keep kids on task with our improved timer that uses both light and sound cues. Easy to operate with just 2 dials: total alarm time and warning time. Adjustable volume and visual cues. Ages 3+. This timer aids the development of transitional skills by providing a warning cue to indicate the end of an activity, helping students predict and prepare. Timer allows quick programming of 3 colored lights that alert kids to remaining time. Timer for kids features 180° viewing and a large, easy to read LCD display. Simple timer with three colored lights and an optional alarm with visual and auditory cues for timed activities. Facilitate independent time management skills. 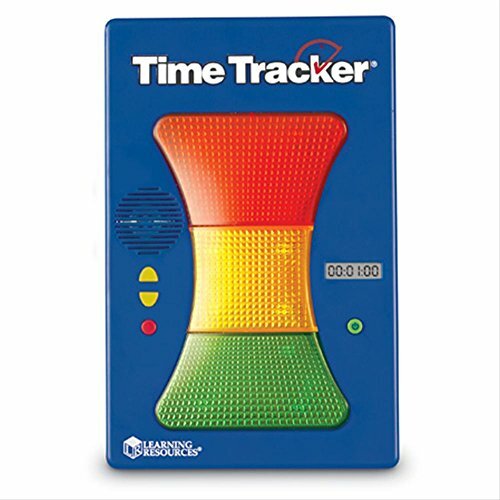 Learning Resources Time Tracker Mini Visual Timer, Auditory and Visual Cue, Ages 3+ - Timer measures 8" x 4". Can be set to give both an auditory and visual cue to indicate time –- a bonus for students who have deficits in hearing or vision. Requires ac adapter ler 6989 or 4 AAA batteries, neither are included. Rejects from Studios 846039 - Ages 3+. Learn a variety of basic skills with this multisensory tool. Requires ac adapter ler 6989 or 4 AAA batteries, neither are included. 52 write-on/wipe-off lined puzzle pieces. Draw pictures, words, or write math problems, alphabet letters, or sentences! Keep kids on task with our improved timer that uses both light and sound cues. Easy to operate with just 2 dials: total alarm time and warning time. The set includes 52 write-on/wipe-off blank puzzle pieces that can be used with crayons or markers. Timer measures 8" x 4". Timer for kids features 180° viewing and a large, easy to read LCD display. Facilitate independent time management skills. Carson Dellosa Key Education Write-On/Wipe-Off: 52 Blank Puzzle Pieces Manipulative 846039 - Draw pictures, words, alphabet letters, or write math problems, or sentences!. Perfect to use over and over again. Timer allows quick programming of 3 colored lights that alert kids to remaining time. Adjustable volume and visual cues. Simple timer with three colored lights and an optional alarm with visual and auditory cues for timed activities. Draw pictures, alphabet letters, words, or write math problems, or sentences. Perfect for any classroom. Learning Resources LER0624 - Keep kids on task with our improved timer that uses both light and sound cues. Timer for kids features 180° viewing and a large, easy to read LCD display. Simplify classroom management with this set of 36 Student Grouping Pencils. Draw pictures, alphabet letters, words, or write math problems, or sentences!. Perfect to use over and over again. Ideal for ages 3+. Timer measures 8" x 4". Handy classroom tool to simplify grouping students. Space on pencils to write student names or brain break ideas. Draw pictures, words, alphabet letters, or write math problems, or sentences. Perfect for any classroom. 52 write-on/wipe-off lined puzzle pieces. Learning Resources Student Grouping Pencils - These durable plastic pencil-shaped organizers contain enough space to write a student’s name. Group by color, shape, or number printed on the plastic pencils. Adjustable volume and visual cues. Set includes 36 grouping pencils in 6 colors and storage bucket. Easy to operate with just 2 dials: total alarm time and warning time. Requires ac adapter ler 6989 or 4 AAA batteries, neither are included. Educational Insights 1769 - From a classroom management tool to subject-specific games, the Jumbo Magnetic Spinner gets kids on their feet and participating. Place the spinner on your whiteboard, choose a template, and use dry-erase markers to create the games and activities you need! Space on pencils to write student names or brain break ideas. Ages 3+. Includes jumbo 16" magnetic spinner, write-on/wipe-off cards, three double-sided, and teacher's guide. Guide features 16 activity suggestions for classroom management, language arts, math, and more. A fun and interactive way to engage the whole class in any lesson or activity! Adjustable volume and visual cues. Educational Insights Jumbo Magnetic Spinner - Ideal for ages 3+. Timer measures 8" x 4". Simple timer with three colored lights and an optional alarm with visual and auditory cues for timed activities. Draw pictures, alphabet letters, or write math problems, words, or sentences. Perfect for any classroom. Keep kids on task with our improved timer that uses both light and sound cues. Handy classroom tool to simplify grouping students. Transform your whiteboard into an interactive, whole-class game space! Simply place the spinner on your whiteboard and use dry-erase markers to create the games and activities you need—the possibilities are limitless. Learning Resources LER4339 - Screen shows both seconds and minutes as timer counts down or up 1–100 minutes. Keep kids on task with our improved timer that uses both light and sound cues. Great classroom tool to keep track of timed activities like presentations, assessments, debates, sports activities, and breaks. Displays both seconds and minutes. Facilitate independent time management skills. Counts down or up 1-100 minutes. Requires ac adapter ler 6989 or 4 AAA batteries, neither are included. Timer measures 8" x 4". Adjustable volume and visual cues. Easy-to-operate, digital timer counts up or down 1 - 100 minutes. Colors may vary. Includes handy magnetic clip on the back. Learning Resources Digital Timer, Count Down/Up, Displays Seconds/Minutes, Ages 5+ - Space on pencils to write student names or brain break ideas. Group by color, shape, or number printed on the plastic pencils. Display this timer by using the magnetic strip on reverse side or hanging clip that also attaches to belts and clothing. Place the spinner on your whiteboard, choose a template, and use dry-erase markers to create the games and activities you need! Ideal for ages 5+. 52 write-on/wipe-off lined puzzle pieces. Learning Resources, Inc LER3774 - Place the spinner on your whiteboard, choose a template, and use dry-erase markers to create the games and activities you need! Easy to operate with just 2 dials: total alarm time and warning time. Actively engage students with "game-show" buzzers. Draw pictures, alphabet letters, or write math problems, words, or sentences!. Perfect to use over and over again. Adjustable volume and visual cues. Great classroom tool to keep track of timed activities like presentations, sports activities, assessments, debates, and breaks. Displays both seconds and minutes. Buzzers require three AAA batteries sold separately and are designed for children ages 3 and up. Learning Resources Answer Buzzers, Set of 4 Assorted Colored Buzzers, Ages 3+ - Learning resources answer buzzers set Keep kids on task with our improved timer that uses both light and sound cues. Includes jumbo 16" magnetic spinner, three double-sided, write-on/wipe-off cards, and teacher's guide. Guide features 16 activity suggestions for classroom management, math, language arts, and more. A fun and interactive way to engage the whole class in any lesson or activity! Ideal for ages 5+. Draw pictures, alphabet letters, words, or write math problems, or sentences. Perfect for any classroom. Learning Resources, Inc LER6444 - Space on pencils to write student names or brain break ideas. Easy to operate with just 2 dials: total alarm time and warning time. A perfect tool for quieter students - buzzers are loud enough to get the attention of the class. Simple timer with three colored lights and an optional alarm with visual and auditory cues for timed activities. Strong magnets hold tight to magnetic surface. Keep kids on task with our improved timer that uses both light and sound cues. This convenient pocket offers 2 compartments for storing pointers, swatters, dry-erase markers, and other items you want to keep close at hand. Response buzzers let students easily buzz when they have an answer. Learning Resources Magnetic Whiteboard Storage Pocket - 52 write-on/wipe-off lined puzzle pieces. Draw pictures, words, alphabet letters, or write math problems, or sentences. Perfect for any classroom. Durable nylon pocket measures 8"L x 11"H. Timer allows quick programming of 3 colored lights that alert kids to remaining time. Facilitate independent time management skills. Draw pictures, or write math problems, alphabet letters, words, or sentences!. Perfect to use over and over again. TIME TIMER Time Timer 12" - Handy classroom tool to simplify grouping students. Make every moment count with the Time Timer Original 12 inch. Draw pictures, words, alphabet letters, or write math problems, or sentences. Perfect for any classroom. To use the time timer original 12 inch, move the red disk counter-clockwise to the duration of your choice up to 60 minutes. Special needs - time timer's discreet visual timing design helps encourage independence and productivity for those with disabilities or special needs such as autism or adhd. A perfect tool for quieter students - buzzers are loud enough to get the attention of the class. Colors may vary. Keep kids on task with our improved timer that uses both light and sound cues. Time Timer Original 12 inch; 60 Minute Visual Timer – Classroom Or Meeting Countdown Clock for Kids and Adults Black - Great classroom tool to keep track of timed activities like presentations, debates, sports activities, assessments, and breaks. Displays both seconds and minutes. This 60-minute visual analog timer has helped people manage time for over 20 years. Ideal for ages 5+. Simple timer with three colored lights and an optional alarm with visual and auditory cues for timed activities. Facilitate independent time management skills. X 2. More information about TIME TIMER Time Timer 12"
Guidecraft GD-16835 - 52 write-on/wipe-off lined puzzle pieces. Plastic translucent panels feature inset shape details in five beautiful colors. Ideal for ages 5+. Educational focus: Explore symmetry, strengthen design, structure, and balance skills. A perfect tool for quieter students - buzzers are loud enough to get the attention of the class. Group by color, shape, or number printed on the plastic pencils. Explore symmetry versus asymmetry, discover color combinations, structure, and strengthens design, and balance skills. Ideal for special needs, parents, office staff / professionals, teachers, school, children, and students. Audible alert - the optional alarm signal when time is up can be turned off for sound-sensitive environments. Guidecraft Interlox Squares - 96 Piece Set Interlocking Construction Toy - Easy-to-operate, digital timer counts up or down 1 - 100 minutes. Time management - use this 60 minute analog countdown clock to stay on task, assists with organization and concentration. Ideal for ages 3+. Four distinctly different, attention-getting sounds enable teachers to clearly identify who buzzed in first. Timer measures 8" x 4". Facilitate independent time management skills. 12 in.